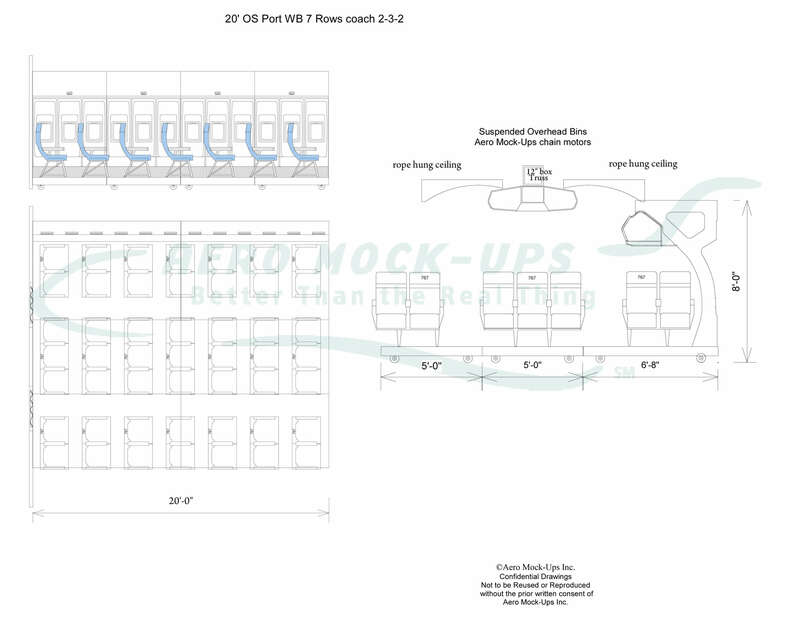 “Rolling” Cabin Set Ups | Aero Mock-Ups Inc.
20’-long, “One-side” cabin set and practical Emergency exit (optional). The other cabin wall is removed for multi camera shows and live audience viewing. Floor width does not allow for a full aisle. This is a supervised set which requires an Aero Mock-Ups Technical Supervisor. Emergency exit is FOB; N. Hollywood, CA. Allow 4 hours to assemble. Allow 2 hours to disassemble. 20’-long, “One-side Narrow body” cabin set. The other cabin wall is removed for multi camera shows and live audience viewing. Floor width is similar to a one aisle “Narrow body” cabin. This is a supervised set which requires an Aero Mock-Up Technical Supervisor. Production provided Set dressing. 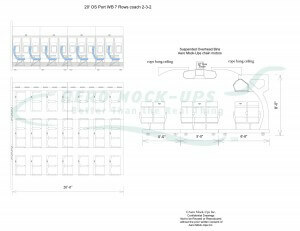 80’-long, “One-side Narrow body” cabin set with three class airline cabin set with forward Service Area and Lavatory door and walls to separate cabin. Allow 2 days to assemble. Allow 1 day to disassemble. 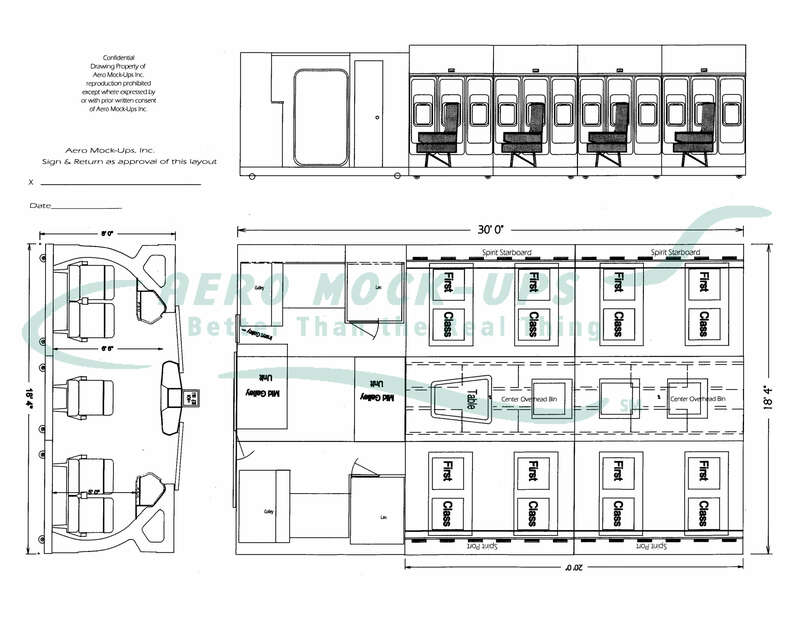 20’-long “One-side Wide body” cabin set with first class seats (photo) and coach class seats (drawing). 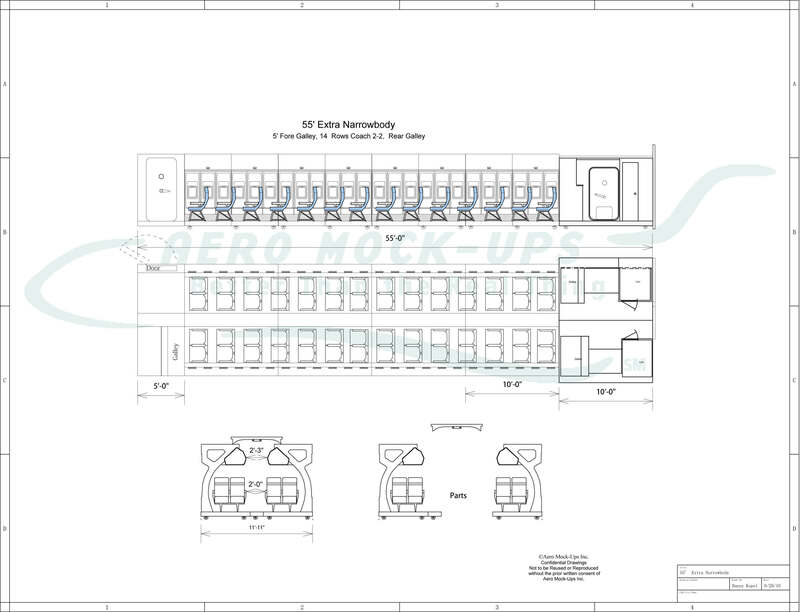 Optional ceiling and center overhead bins. This is a supervised set which requires an Aero Mock-Ups Technical Supervisor. Allow 7 hours to assemble. Allow 4 hours to disassemble. Los Angeles, New York, or shoot at our facility in N. Hollywood, CA. 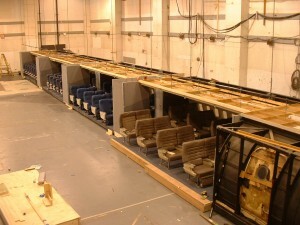 Complement of Seats and set-related Set Dressing. 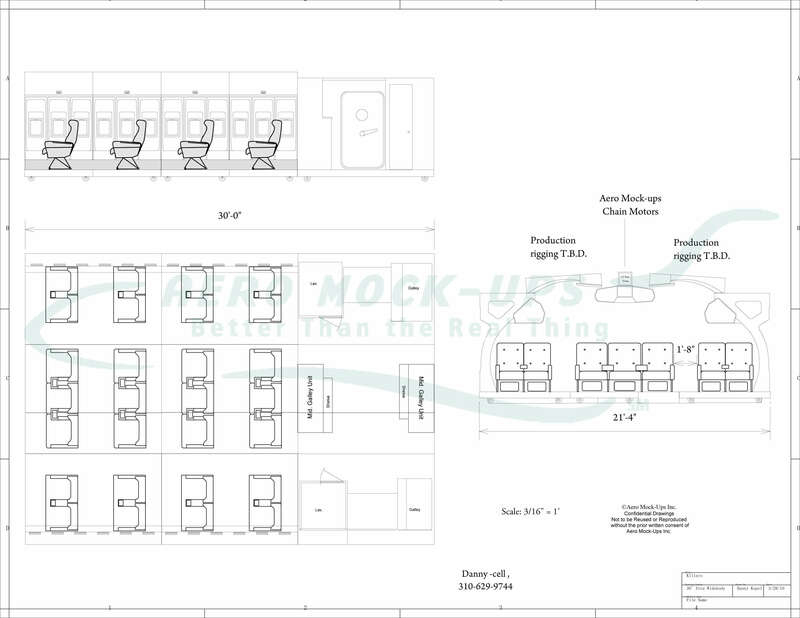 Cockpit, Service Areas, Ceiling, Center overhead bins, Doors and Walls. Forklift driver, three (3) Carpenters and Set Dressers. 5,000 lb. capacity — Max blade width 5 inches. Or overhead permanents required to hang ceiling. Regulated compressed air required to deploy oxygen masks. 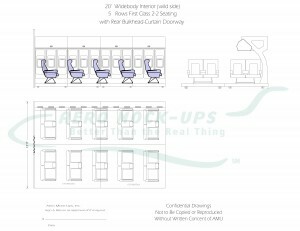 40’-long, one-aisle “Commuter/Regional wide” cabin. Suitable for 2-2 across Coach class seats. Production provided seats. This is a supervised set which requires an Aero Mocks-Ups Technical Supervisor. Allow 10 hours to assemble. Allow 5 hours to disassemble. Los Angeles or shoot at our facility in N. Hollywood, CA. 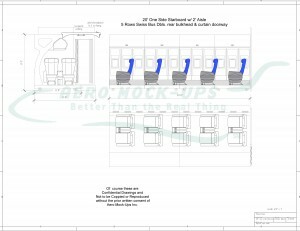 Cockpit, Service Areas, Doors and Walls. Forklift driver, three (3) Grip/Carpenters and Set Dressers. 20’-long, one-aisle “Narrow body” cabin with Coach class “737” seats and rear Service Area. This is a supervised set which requires an Aero Mock-Ups Technical Supervisor. Allow 5 hours to assemble. 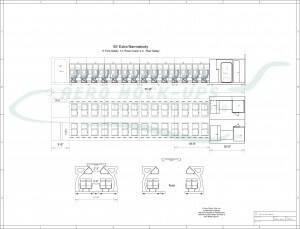 50′-long, one-aisle “Narrow body” cabin with First class “AA” and Coach/Economy class “737” seats and rear Service Area. This is a supervised set which requires an Aero Mock-Ups Technical Supervisor. Allow 12 hours to assemble. Allow 6 hours to disassemble. 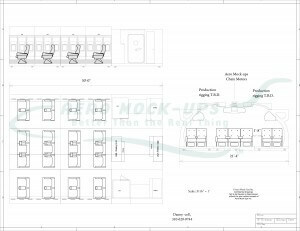 Cockpit, Service Areas, Ceiling, Doors and Walls. 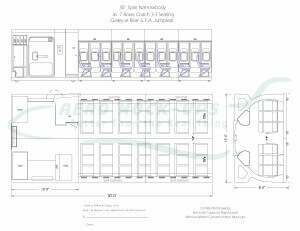 20’-long, two-aisle “Wide body” cabin with First class “AA” seats covered in red vinyl covers and forward service area. Production set dressed. This is a supervised set which requires an Aero Mock-Ups Technical Supervisor. Allow 1 day to assemble. 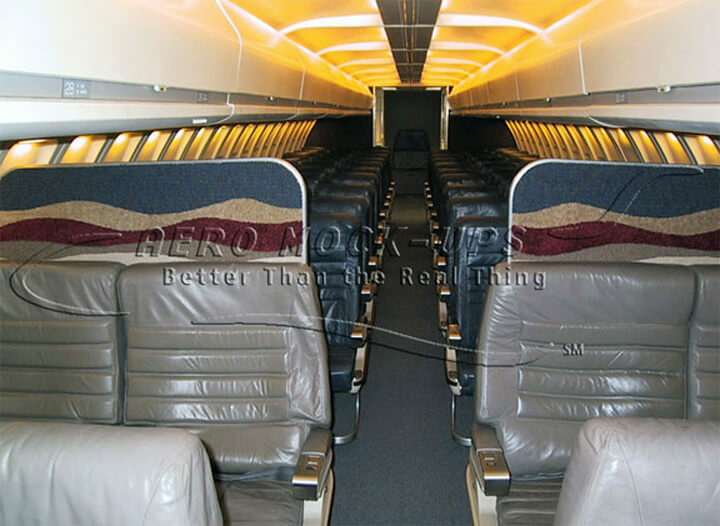 40’-long, two-aisle “Wide body” cabin with coach/economy class “767” blue cloth with diagonal red stripe seats and rear Service area. This is a supervised set which requires an Aero Mock-Ups Technical Supervisor. Allow 15 hours to assemble. Allow 7 hours to disassemble. Sufficient to carry center overhead bins and ceiling. 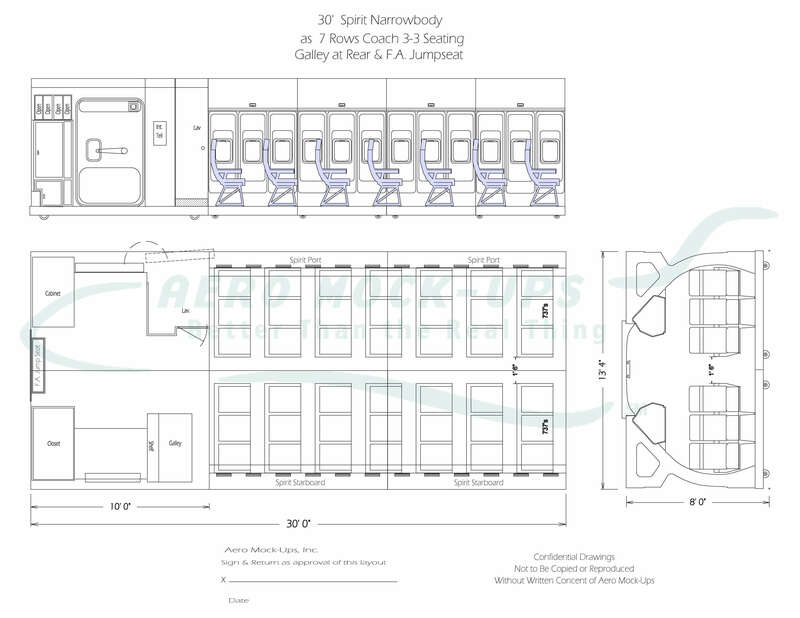 20’-long, two-aisle “Extra wide body” cabin with coach class “AI” seats and rear service area. This is a supervised set which requires an Aero Mock-Ups Technical Supervisor. 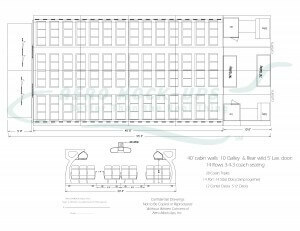 50’-long, two-aisle “Extra wide body” cabin with first class “Tombo” tan vinyl and coach class “AI” seats. This is a supervised set which requires an Aero Mock-Ups Technical Supervisor. Forklift driver, three (3) Grips, three (3) Carpenters and Set Dressers. 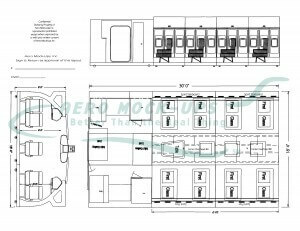 30’-long, two-aisle “Jumbo wide body” cabin with Business class “Rumbold” blue cloth and rear service area. This is a supervised set which requires an Aero Mock-Ups Technical Supervisor. 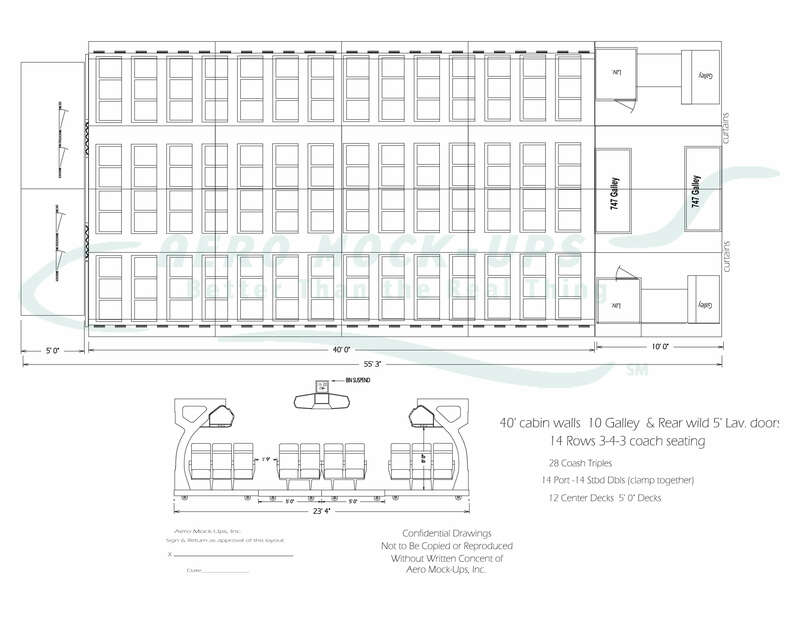 50’-long, two-aisle “Jumbo wide body” cabin with ten across coach class “767” seats and rear/back service area. This is a supervised set which requires an Aero Mock-Ups Technical Supervisor.